In my ode to mothers, after Mother’s Day, I dedicate this blog to my blessed mother who passed several years ago, and my dear mother-in-law. When I think of how much grief my mother put up with raising twin sons alone after my daddy was killed, I always think of mothers who put up with a lot worse, including losing children in wars. We certainly now have many mothers who have lost sons and daughters in Afghanistan and Iraq, and I’d like to offer this print by Charles White as a tribute to mothers who have put up with a lot more than just a pair of “tornado twins,” and who represent the backbone of every society on the planet. Often I feel that just having one day devoted to mothers is entirely not enough. They’re on duty 24/7 year round! Charles White (1918–1917 US) benefited greatly from the impetus given black artists during the Harlem Renaissance (ca. 1918–1939). The Harlem Renaissance gave him, and other black artists, a cultural orientation. White felt that the writers and artists of the movement gave African Americans an awareness of their cultural identity. There was intent by black artists of the period to reflect African American life rather than follow trends in European modernist circles. That being the case, White’s marriage to artist Elizabeth Catlett (1919–2012) helped introduce him to trends in European modernism that he adopted in his art from the 1930s to mid-1940s. While painting murals for the WPA in the late 1930s, White learned that art could help uplift black people and give them pride in their culture. He decided during this period to concentrate of drawing and graphic arts as his preferred medium. 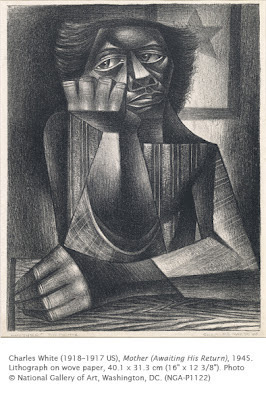 This print shows the cubist influence in White’s work of the late 1930s and early 1940s, an aspect that he eventually abandoned in the late 1940s because he felt it lessened the human impact of his subjects. Nonetheless, this work makes an important statement in the history of American art, and American society. It was not just white mothers who suffered the loss of their sons and daughters in World War II (1939–1945). African American mothers also suffered the loss of sons and daughters serving their country in segregated regiments. This print serves to show how mothers are the backbone of every society. Despite the cubistic treatment of the subject, White created a monumental image in a Renaissance-style pyramidal composition. It’s a solid statement about mothers. Visit www.goldstarmoms.com For more about Gold Star Mothers (those awaiting missing children during war). Activity: Exploring different media to capture expression or mood. Draw a real or imaginary face, making sure to consider realistic proportions. By paying attention to extreme changes in value (light and dark), the portrait can capture a mood or expression. Use media like charcoal, crayon, or soft pencil so that it is easier to achieve a wide range of dark and light values.